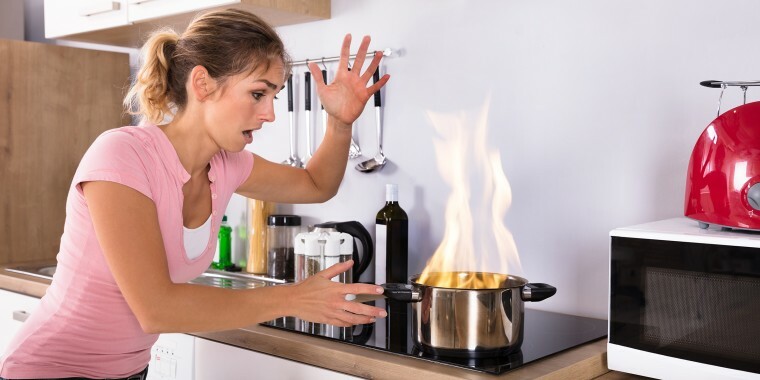 Oct. 9 marks Fire Prevention Day and with home fires responsible for 10,600 injuries and 2,630 deaths in the U.S. in 2017, according to the National Fire Protection Association, it's a good time to think about what you'd do if flames suddenly appeared while you were cooking. Instead, pour regular baking soda over the whole fire. Use the entire box. And don't try other baking products like flour; they won't work. Another tip for putting out a grease fire: If you can safely slide the lid of the saucepan over it, that will put out the flames. Fires can't exist without oxygen. Remember: Thanksgiving is the peak day for home cooking fires, so keep these tips in mind for your gathering next month!